Within advertising (TV ads in particular), there has long been an inherent suspension of disbelief. But in today’s overcrowded marketplace, sometimes brands have to go to extreme lengths to stand out from the crowd – hence the rise of absurdist marketing. Absurdist marketing isn’t really about what your company can offer; it’s about how long your name stays in your audience’s mind afterwards. It requires you to allow the unexpected creative to take the spotlight and construct a new perspective on something common or mundane. Geico is a perfect example of this aesthetic. Everyone knows they need to buy car insurance, so the marketing team doesn’t have to work as hard to sell them on the product. Instead of highlighting the features of the service, they focus their efforts on market saturation. 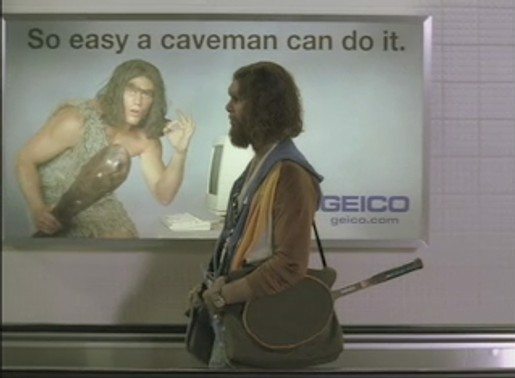 Geico hopes their commercials featuring a frustrated caveman or a talking gecko will keep their name fresh in customers’ minds – so when they do go looking for a new insurance plan, they’ll look Geico up first. While absurdist marketing is often employed when your product falls into the category of a universal need, e.g. insurance, any company can incorporate a little wit or whimsy into their marketing. Do your homework. Absurdist marketing isn’t a creative free-for-all; the rules of content marketing still apply. Effectively injecting humor into your campaigns still requires a deep understanding of your audience, the platform where your content will live, and your ultimate goal. Once you’ve dissected the core of what drives audience engagement, your creative team can start to create new and unexpected ways of shifting how people see and engage with your brand. Be authentic. We’ve talked about the importance of cultivating an authentic brand in the past, but it’s especially critical when you dabble in the absurd. Today’s empowered customer is driven to purchase products and services from companies they perceive as authentic – and one poorly conceived, tone-deaf attempt at humor from an outsider can send your target market running in the opposite direction. Go with the flow. Ask any comedian and they’ll tell you how subjective humor can be. What works in San Francisco may not fly in Atlanta. Absurdity can be unpredictable, but don’t overthink or second guess your campaign too much. Develop a loose response strategy (e.g. how comedians prepare a few zingers for hecklers), but be prepared to take things as they come and adjust your strategy as needed. Don’t take yourself too seriously. Creatively speaking, the internet has opened a lot of doors to try new things and target niche audience segments – and that can be polarizing. Sometimes people love what you’re doing, sometimes they just don’t “get it.” And you know what? That’s OK. Emotion is one of the strongest connections in the brain to help your brand stand out. Nobody wants a potential customer to unsubscribe, but sometimes that saves time for the customers who are true champions for your brand.